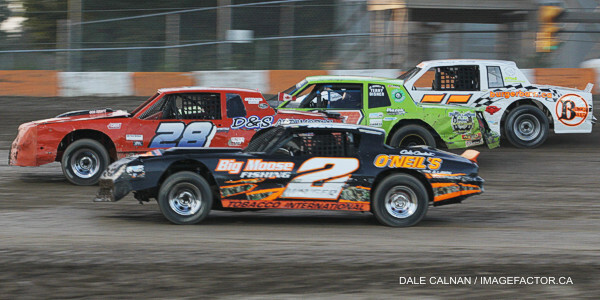 by Tommy Goudge (August 16, 2013) – 100 drivers signed in to race on Gale’s Auto Aftermarket “Brock Leonard Memorial Night” and KidsRace Canadian National Autism Foundation night at Ohsweken Speedway on Friday. Kyle Patrick and Mikey Kruchka took Corr/Pak Merchandising Sprint Car feature wins, while Ryan Turner won the 2nd annual “Brock Leonard Memorial 50” for the Affordable Towing & Recovery Thunder Stocks, Davey Boughton won his 6th HRW Automotive Mini Stock feature of the season, and Chad Foster visited Klotz Canada Synthetic Lubricants Victory Lane for the first time after the Gale’s Auto Aftermarket Bombers feature. 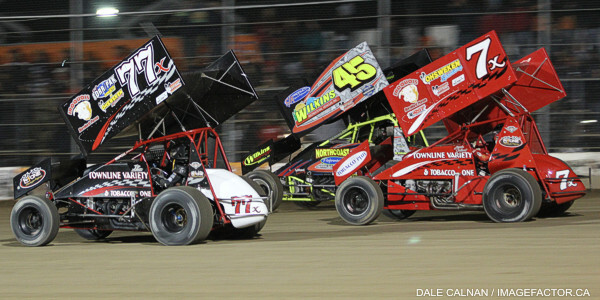 The Sprint Cars had some extra racing on their schedule on Friday night, as their postponed A-Feature from July 19 was run before the week’s regularly scheduled racing. Glenn Styres and Kyle Patrick started on the front row of the make up feature, but a lap wasn’t completed before Jared Zimbardi got sideways in turn 2 and collected points leader Jim Huppunen. Zimbardi’s front end was too heavily damaged for him to continue, while Huppunen’s crew was able to make repairs. Mitch Brown got to the front when the race restarted, and opened an early lead. The race was slowed several more times, as Scott Sherk spun in turn 3 and collected Todd Hoddick, while Glenn Styres spun in turn 3 on two separate occasions. Jim Huppunen wasted no time getting back in contention, as he was already back in the top 10 by lap 8. Brown’s lead evaporated each time a caution flag came out, and Kyle Patrick took advantage by taking the lead at the halfway mark. Patrick had to stay ahead of Chris Steele for one final restart after a nasty crash on the front stretch involving Kyle Moffit, who climbed uninjured from his heavily-damaged car. Patrick took his second win of the season, followed by Steele. Jim Huppunen got by Steve Collins for third on the last lap, while Collins crossed the line fourth, followed by row 10 starter Jamie Collard. Collins was disqualified after the race for a technical infraction, which allowed row 11 starter Mikey Kruchka to claim the 5th spot. Mikey Kruchka and Jamie Collard began the regularly-scheduled Sprint Car feature on the front row, and Collard led the first lap, but Shane Ross got by both of them to take the lead on lap 2. The sophomore driver was able to stay in the lead for 3 laps before Chris Steele moved into the lead, but Steele led just 2 laps before Collard got by to lead lap 7. Collard’s lead was short-lived again though, as Mikey Kruchka went from 4th to 1st on lap 8, and went on to take a feature win for the second straight week. Collard chased Kruchka to the finish line, and survived a close call with 2 laps to go to take the runner-up spot. Dain Naida got the third spot, followed by Glenn Styres, and Jim Huppunen. The race went start to finish without a caution flag, and Mikey Kruchka set a new track record for a 20 lap Sprint Car race at 5:45.197, with Jamie Collard also under the previous record held by Tom Huppunen. Heat races for the 28 car field were claimed by Conor Mahoney, Jim Huppunen, and Shane Ross, while Kyle Patrick won the B-Main, and Jim Huppunen won the Nathan Ackland State Farm Insurance “Top Gun” award for accruing the most heat race passing points. Brett Rodwell and Robbie General made up the front row for the 2nd annual Brock Leonard Memorial race for the Thunder Stocks, but Chris Dickie led the first 2 laps before Ryan Turner made a beeline to the lead from his starting spot in row 6, with brother Cory close behind. Karl Sault also moved up early, and took the 2nd position from Cory Turner on lap 9. Ryan Turner and Karl Sault ran nose-to-tail for much of the rest of the 50 lap distance, with Sault occasionally getting alongside as the pair raced through traffic. Dave Silverthorn, Jr. was also on the move early in the race, and was into the top 10 from his row 11 starting spot by lap 9. Silverthorn continued to pick up more spots, and took the third position from Cory Turner just before the halfway mark. Silverthorn was more than 7 seconds behind the leader, but a yellow flag helped to erase some of that deficit. He restarted with several lapped machines between himself and the two leaders, but eventually got by those cars and ran down Sault and Turner, who swapped the lead several times with less than 15 laps remaining. Ryan Turner was able to use slower traffic to retake the lead on lap 46, and keep Sault and Silverthorn at bay to get the big win. 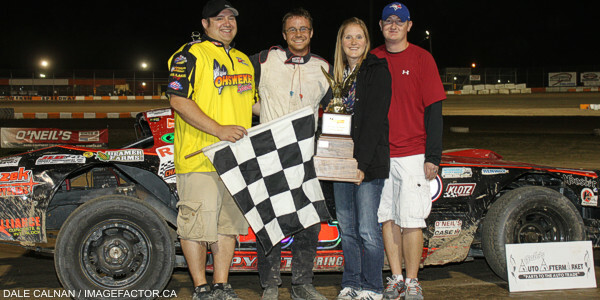 Sault settled for the runner-up spot, followed by Silverthorn, Jack Myers, and points leader Lee Winger. Heat races for the 34 car field were claimed by Brett Rodwell, Mike Thorne, Lee Winger, and Pete Reid, while Brad Herron won the B-Main. Mike Giberson and Jade Pelletier led the field to the green flag in the Mini Stock feature, but Brittani Myers took the lead early in the race for the second week in a row. Davey Boughton was on a mission to atone for last week’s flat tire which cost him a feature win though, and eventually took the lead and went on to win his 6th feature of the season. Jason Lungaro moved through the field from close to the rear for the second week in a row, and took the second spot, followed by Jeremy May, Alex Schuts, and Brittani Myers. Heat races for the 24 car field were claimed by Chad Smelser, Jeremy May, and Davey Boughton. Chad Foster and Tim DeBoer started up front in the Bomber feature, and Foster took the early lead. The race was red flagged for a wild flip by Mark Bazuin, who climbed out of his car uninjured. Foster held off several determined drivers to get his first career feature win, followed by Bob Burgess, Brady Longboat, Dusty DeBoer, and Tim DeBoer. Heat races for the 14 car field were claimed by Tim DeBoer and Dusty Deboer. Nathan Ackland State Farm Insurance presents “Labour Day Special” Night at Ohsweken next Friday, August 30, featuring Corr/Pak Merchandising Sprints, Affordable Towing & Recovery Thunder Stocks, HRW Automotive Mini Stocks with a full program plus their postponed feature from July 19, Gale’s Auto Aftermarket Bombers, and TUSA Canada West Mod Lites. Spectator gates open at 6:00pm, with racing starting at 7:30pm! 1. 12 Brad Herron, 2. 9 Dave Silverthorn, Jr., 3. 84rk Ryan Beagle, 4. 04 Wyatt Van Wart, 5. 17 Rob Disher, 6. 777x Steve Hess, 7. 68 Aaron Turkey, 8. 38 Terry Martin, 9. 85b Ryan Dinning, 10. 31 Dave Bailey, 11. 93 Melissa Miller, 12. 911 Nick Liverance, 13. 48 Mike Graham, 14. 4 Dale Gyokery, DNF. 3b Blaine Barrow. No Time. 1. 90 Chad Smelser (Dunnville), 2. 69 Rob Twitchett (Dundas), 3. 81 Alex Schuts (Oakland), 4. 22 Brittani Myers (Hamilton), 5. 05 Dave Goodacre (Brantford), 6. 11 Mike Giberson (Caledonia), 7. 1 Kathi Dickie (Brantford), 8. 84 Jade Pelletier (Wainfleet). 1. 16 Jeremy May (Hamilton), 2. 79 Steve Miller (Paris), 3. 10 Laura Hughes (Puslinch), 4. 76 Jamie Goudge (London), 5. 21 Jonathan Ayrton (Hamilton), 6. 69e Dan Erskine (Caistor Centre), 7. 7x Chase Hess (Ohsweken), DQ. 66 Brandon Janssens (Woodstock). 1. 18x Davey Bougton (Carlisle), 2. 29 Lucas Lubin (Hamilton), 3. 7 Jason Lungaro (Hamilton), 4. 66r Cole Rodwell (Caledonia), 5. 77 John Held (Hagersville), 6. 53 Mark Verhuel (Dundas), DNF. 96t Mike Taylor (Hamilton), DQ. 265 Mike Evers (Caledonia). 1. 9 Tim DeBoer (Caledonia), 2. 43c Chad Foster (Hamilton), 3. 28 Bob Burgess (), 4. 97 Max Chechalk (5), 5. 188 Paul Longboat (Ohsweken), 6. 6 Wayde Thorne (Waterford), 7. 03d Clinton Nicholls (Hamilton). 1. 23 Dusty DeBoer (Hagersville), 2. 66 Brady Longboat (Ohsweken), 3. 88 Mark Bazuin (Caledonia), 4. 42 Joe DeBoer (Hagersville), 5. 14 Gerald Burnham (), 6. 36 Skip Brandow (Orwell), 7. 18 Adam Hallet (Cambridge).